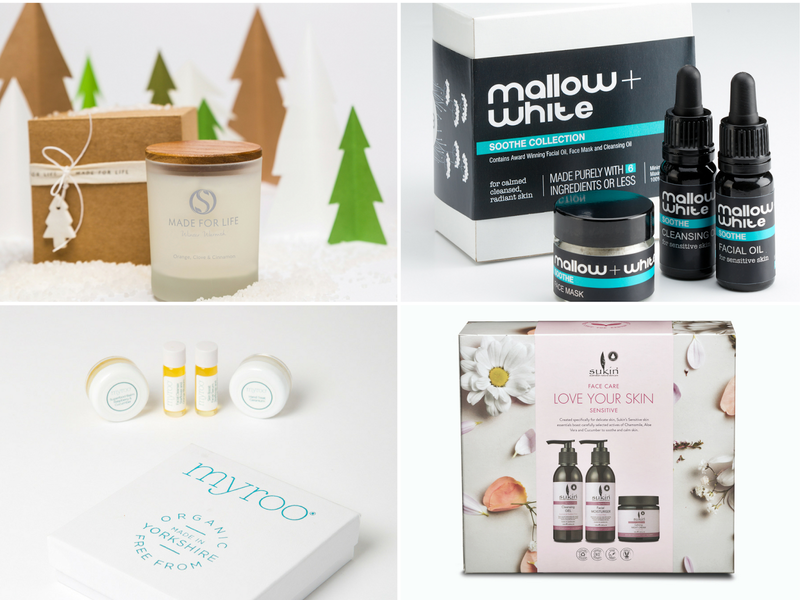 I'm changing things up this year and I'm focusing on Christmas Gifts for sensitive skin. I love when Santa brings me skincare but with allergies and sensitivities it can be a little tricky for friends and family to know what to buy. That's where I step in with this handy guide for you to drop them hints. Of course these brands also have products suitable for a variety of skin types so check them out. All Natural Soap have won several awards for their natural, handmade and cruelty free soaps. The entire range is vegetarian with vegan options and they do not use palm oil. There is a wide range of gifts on their site but I'll point you in the direction of the Sensitive Skin 8 Bar set. The box contains Castile Olive Oil x 2, Gentle Goat’s Milk x 2, Shea Luxury x 1, Oatmeal Soother x 1, Coco Castile x 2. If the selection isn't to your liking then perhaps choose the Custom 8 Bar Box where you make your own choices. Conscious Skincare Pure range is designed for highly sensitive skin types and products are fragrance free. New items will be added to the range expanding it to include body wash, body lotion, shampoo and conditioner. They offer lots of gift options for men and women. Conscious Skincare are approved by the Vegetarian Society, PETA, and Cruelty Free International. Gerlinde Naturals have gift sets option and offer the choice to order fragrance free versions of their products. You could pick from the Gift Box with 5 products or the Double Cleansing Method, both come beautifully boxed with tags and ribbon so ready to be given as a gift. Pictured above is the Soothing Toner which I'm currently using, it's fragrance free with aloe vera and green tea extract. All products from this brand are suitable for Vegans. Green People have teamed up with Plantlife, a UK charity working to save threatened species of wild flowers, plants and fungi, to inspire the new Modern Botanicals gift collection of certified organic skin, hair and body care products for men and women. The Leaf & Stem gift set contains shower gel & lotion from their Scent Free range. Made for Life by Spieza Organics have lots of gift ideas, when viewing their website check out the "made for Christmas" section. I particularly like the Bath Baubles but they do contain essential oil allergens. The Made for Christmas Candle might make a lovely alternative if you are worried about suitability, avoiding skincare is always a safe bet. Mallow & White Soothe Cleansing Oil is my favourite product from this brand, it's fragrance free but has a delicate cucumber aroma. I've been informed that mini gift sets will be launched in time for Christmas so look out for those. The Soothe & Restore collections are aimed at Dry and Sensitive Skin. Myroo is a brand that fully understands allergies, products are available fragrance free but across the range they are also 14 food allergen free and vegan suitable. The Mini Trial Sized Skincare Set would make a nice stocking filler and help someone to discover the range. Silvan Skincare offer a range of oils, creams, balms and salts. For those with sensitive skin I would point you in the direction of their Soothe and Extra Gentle products. The Extra Gentle Facial oil was shortlisted in the 2017 Free From Skincare Awards and has received positive feedback from customers who experience eczema. Sukin gift sets give you a 3 step routine and have every skin type covered - chose between Love Your Skin for all skin types, Love Your Skin: Sensitive, Love Your Skin: Oil Balancing and Super Greens Facial. I have reviewed a couple of products from the sensitive range so I'm happy to recommend. These sets will be available from Holland & Barrett stores. The Rose Tree is an award winning, luxury brand, they have several gift options and are due to release some new boxes this month. Online Retailers - if you prefer to shop in one place then check out my personal favourites Love Lula, Naturisimo and Content Beauty, all of them now have a Christmas Gift section. Thanks for the suggestion, I’m going to see if some of these companies ship to the US. Merry Christmas in advance!